Wikipedia is the go-to source of knowledge for human beings around the globe. That’s why the Wiki Education Foundation’s Year of Science campaign works with science classrooms in US and Canadian universities. Together, we’re bringing clearer, more comprehensive knowledge about science to the public. But just as knowledge transcends borders, so does Wikipedia. So we were excited to watch the Year of Science take on a life of its own in Brazil. João says there was about a 30-year gap between the the science reflected in the sources on Portuguese Wikipedia, and the cutting-edge developments being made in that field. 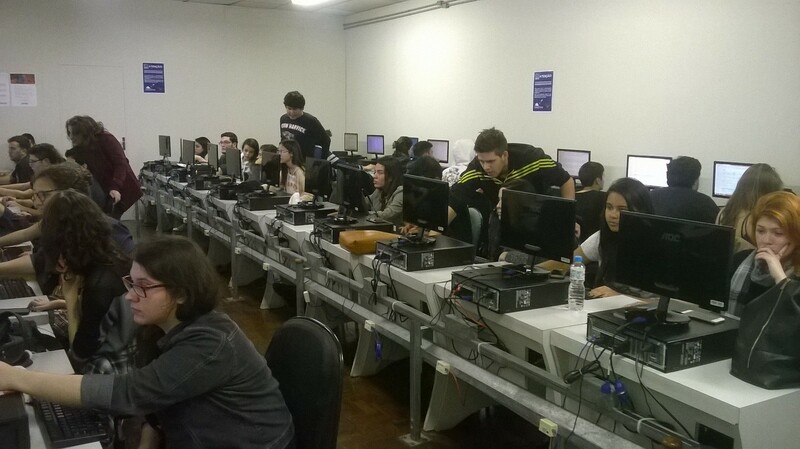 Workshop on editing Wikipedia with students of Social Communication at Faculdade Cásper Líbero, with David Alves, member of the User Group Wikimedia Brazil. Photo by Joalpe – Own work, CC BY-SA 4.0. The Brazilian initiative has added thousands of words on topics pertaining to mathematical properties of neural dynamics to the Portuguese Wikipedia. For example, they’ve expanded the Portuguese language article about Alzheimer’s disease, and more complex topics such as brachial plexus injury. They also created the entry on biological neuron models, and created a video that explains “Spike sorting” — a way of tracking and measuring the electrical properties of cells — which appears on both the Portuguese and English editions of Wikipedia. In their model, experts and researchers work to explain concepts to volunteers from theWikimedia Community User Group Brasil. They go on to write articles based on that expert engagement. Many of the authors are postdoctoral researchers. João, alongside Wikipedian-in-Residence David Alves and long-time Wikipedia volunteer Célio Costa Filho, have been drawing on Wiki Ed’s US-Canadian Year of Science model to expand the program in their own country. David is a journalism graduate who started editing Wikipedia for a class project taught by João. He’s now the first person to receive a state grant to promote Wikipedia in Brazil, thanks to the São Paulo Research Foundation. “Researchers supply qualified, technical knowledge, and we transform the content to a more comprehensible and clear one,” Alves said. We’re excited to see the idea and tools we’re creating to help take knowledge beyond classroom walls are, themselves, reaching across borders. The Wikipedia Year of Science really is a global phenomenon, and we’re excited to see the work that volunteer Wikipedians and groups are taking on around the world! Photo: Flag of Brazil by Governo do Brasil. Similar file available at Portal of the Brazilian Government (accessed in November 4, 2011), Public Domain.